The issue of Crimean Tatars, who survived terrible Sürgün – mass deportation from Crimea by Joseph Stalin on 18 May 1944, and who returned back home after Ukraine gained its independence, remains still unresolved and very sensitive, as Ukrainian government paid unfortunately very little attention to the problems of Crimean Tatars, and Russian military invasion and illegal annexation of Crimea in March 2014 made situation of Crimean Tatars, who are indigenous inhabitants of the peninsula, tenser and more problematic. Crimean Tatars, who opposed Soviet regime during their exile in Central Asia, appeared to be patriots of Ukraine and expressed their opposition to Russia and pro-Russian forces in Crimea after its annexation. Traditional Crimean Tatars’ authorities and representative bodies, such as Qurultai (Parliament) and Mejlis (representative body of Qurultai), remain on their position of non-violent struggle for regaining the rights and freedoms of Crimean Tatars and call to keep low profile and not to engage in any radical or violent activities. But Crimea hosts not only liberal and traditional, democratic Islamic organizations and groups, such as official bodies Mejlis and Qurultai and Crimean Tatars National Council, formed by the prominent human rights advocate and dissident Mustafa Djemilev in Uzbekistan during the exile times, but also some radical and extremist Islamist movements and groups, which aren’t numerous currently and didn’t engage in any criminal or violent activities on the territory of Ukraine, but which ideas spread rapidly in the region and which influence increased significantly during the latest years. And this issue considered being among the most problematic and even dangerous issues of the regions, as many experts and local representatives of traditional Islamic organizations warned systematically about the real threat of radicalization. Thus, speaking about Crimean Islamist groups and organizations, it’s worth mentioning that there are two major Muslim organizations in Ukraine and Crimea, controlling activities of the Islamic groups and institutions. These are DUMU (Spiritual Administrations of Muslims in Ukraine) and DUMK (Spiritual Administration of Muslims in Crimea). As for Crimea, there are presently 391 Muslim religious groups, institutions and organizations in Crimea, while only 344 of them operate in Crimea legally and are registered by DUMK. The remaining 47 organizations are unregistered and unofficial and call themselves “independent Muslim communities”, and most of them represent radical and extremist ideology and allegedly have close ties and links with the foreign Islamist and jihadist groups. Most of them don’t recognize DUMU and DUMK and reject their authorities. Islamist radical and extremist groups in Crimea include the groups like Hizb ut-Tahrir al-Islami, Milli Firqa, Davet, Ansara, Ar-Raid, Crimean Tatar Popular Front, NGO Sebat, Takfir wa al-Hijra, Ahl al-Sunnah wa al-Tamaat and others, though it’s worth mentioning that most of them are marginal groups, with exception of Hizb ut-Tahrir and Ar-Raid. It’s important to note, that Islam came to Crimea in 14th century. It was an official religion of Crimean Khanate and was really tolerant and peaceful form of Islam, as people of different faiths coexisted on the peninsula. There were no religious wars registered on the territory of Crimea, thus, Islam in Crimea never was radical and fundamentalist. Crimean Tatars in their majority are Sunni Muslims, of Hanafi current, which is actually a liberal and non-conservative form and interpretation of Islam. In addition to that, due to historical reasons, Islam for Crimean Tatars is more an issue of a national identity, cultural and historical factor rather than an issue of religious identity, and many liberal Islamist movements, such as Crimean Tatars National Council, are rather political organizations than religious ones and they are committed to non-violent struggle. But de jure illegal position of the representative Crimean Tatars’ authorities, such as Mejlis, and continuous conflicts with the local Crimean pro-Russian government and pro-Russian activists, who are traditionally hostile towards Muslim Crimean Tatars, weakened the positions of liberal Islamist forces, opening the doors for more radical groups, who offer the decisions and ways to resolve long standing crisis and problems, such as land, social, economic and cultural problems, unemployment, injustice etc. Crimean pro-Russian government and current occupant authorities as well always questioned the authority and legal status of Mejlis, trying to undermine its role and to dissolve it, what creates deeper problems and confrontations within the local society and helps spreading radical and fundamentalist Islamist ideas and groups as a response to the continuous restrictions and oppression. Weakening the role and position of Mejlis and Crimean Tatars National Council limits the ways and possibilities of peaceful, legal, democratic and non-violent resolving of the current problems of Crimean Tatars and could be a reason for stronger influence of fundamentalism, as radical and extremist groups have other methods and ideology. That is what is happening currently in Crimea, as radical Islamist groups gain more and more popularity, especially among the local youth. Crimea cannot be considered being a really dangerous zone, but it could potentially turn into one, especially considering the fact that we can observe an expansion of foreign fundamentalist and jihadist ideology in Crimea. One of the most numerous Islamist radical organizations operating in Crimea is Hizb ut-Tahrir al-Islami (Party of Liberation of Islam), which was originally founded in 1953 in Jerusalem, by the local Islamic judge Taki ud-Deen an-Nabahani. His ideas spread rapidly in Arabic, Middle Eastern, Central Asian and even Western European countries, and the group itself was branded as a terrorist organization and banned in many countries, including the Muslim countries as well. This group started its work in Crimea in 2003. In Ukraine though Hizb ut-Tahrir isn’t banned as its members never engaged in any criminal, violent and terrorist activities in Ukraine and operate rather as a political party with the religious background. Hizb ut-Tahrir is a well organized group with the strict hierarchy, but there are no specific requirements for the potential new members. But the process of their further learning and training could take years. Hizb ut-Tahrir has nearly 30-35 thousand followers in Crimea and their number grows rapidly. The group’s ideas and ideology are especially popular among the young people who seek for more active and decisive steps and resolving of their problems. Hizb ut-Tahrir gives them these decisions, as it operates with the classical Wahhabist ideology. The main gains of Hizb ut-Tahrir are restoring of the true and “pure” Islamic lifestyle and creation of a unified Islamic state – Caliphate, – based on Islamic Law. Hizb ut-Tahrir ideology is actually Wahhabi ideology, with the calls of preserving Islam in its initial form, like it existed in times of Prophet Mohammed. They also reject state borders and any forms of national and cultural identity, as it all should be sacrificed for the sake of an Islamic State, where people are united only with their religious identity. Thus, members and ideologists of Hizb ut-Tahrir call for creation of a unified Islamic state and for imposing Sharia Law and for the further spread of Islam all over the world and global jihad. As for the current work, the group divides it into several stages. The first stage is about creation of network and its structure, the second stage includes spread of these ideas, the next stage includes creation of an Islamic state, and then, after the Caliphate will be created, Islam and its ideas should be spread all over the world. The group’s ideology is a traditional Wahhabi and Salafist ideology, which includes also elements of jihad. It’s worth mentioning though that Crimean members and representatives of Hizb ut-Tahrir don’t justify violence against the innocent people and prefer to use ideological means of struggle rather than radical and violent ones. Hizb ut-Tahrir is one of the most powerful and numerous jihadist organizations in Crimea and it has a wide and well organized network of activists and many institutions as well, including schools, cultural and religious centers and mosques. Actually, one of the most important problems of Muslims in Crimea is seizure of many mosques by the activists and members of Hizb ut-Tahrir, where they spread their ideology and recruit new members. One of their practices is also replacing the liberal and moderate imams and mullahs with more radical and fundamentalist preachers, most of whom are either foreigners (predominantly Arabs) or received their religious education in Middle Eastern religious institutions. Thus, Hizb ut-Tahrir actually uses the Caucasian model in its activities, when the ideas are being exported to the region by the foreigners and spread all over the peninsula. 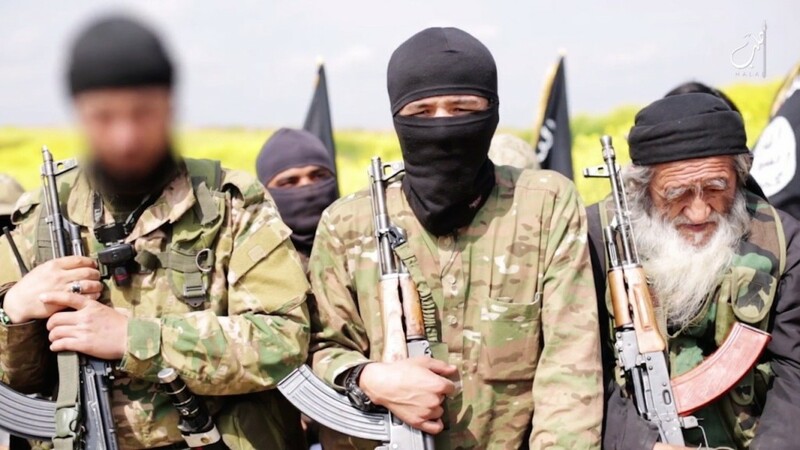 But, despite the fact that Hizb ut-Tahrir never engaged in the violent activities in Ukraine (unlike in Tatartstan, for example), its militants were among the fighters with Bashar Al-Assad’s regime in Syria, and many of them returned home with the new ideas and influences. Prominent political expert Vladimir Djaralla indicates that Crimean Islamists and especially members of Hizb ut-Tahrir are of course a part of the global Islamism, as they have the same ideas and the same goals and close ties with the foreign jihadist and extremist and fundamentalist organizations. The current events also opened the doors for the possibility of increasing of their activities and their further radicalization. Among the other radical Islamist organizations are some Salafi movements, for example, NGO Sebat, headed by the prominent local Islamist preacher Arsen Abu Akhiya. It’s a group of Crimean Salafi Muslims, promoting ideas of conservative Islam. But unlike other radical Islamist groups in Crimea, who denounce the authority and role of the official and moderate Islamist institutions, Sebat is more loyal to them, as its members want to cooperate the members of government as long as the problematic issues, including the painful land issue, will be resolved. But Sebat also opposes Mejlis and was among the groups engaged in the anti-Mejlis protests held in Crimea in 2011. There is also Crimean Tatar Popular Front, operating in the peninsula and gaining also more support. It’s actually an umbrella group uniting several Islamist radical groups and forces, most of them oppose Mejlis and protest against its activities. This Front though is more a political organization rather than a religious one, and most of the groups of it are known for their calls for Russian interference and assistance and anti-Ukrainian position. For example, Crimean marginal radical Islamist political party Milli Firqa has an obvious pro-Russian stance and even called for Russian intervention in Crimea in 2008, during Russian led war in Georgia, in order to “protect the people of Crimea from Ukrainian nationalists”. This group didn’t have significant support, but it could experience its revival today, cooperating with the occupation authorities in the annexed Crimea. Other Crimean Islamist groups are Davet, which is a group operating in the framework of the Hizb ut-Tahrir activities, and recently created Ansara – a female radical Islamist group. These groups also support fundamentalist Islam and are on the stage of “radicalization”, as many of them include the newly converted Muslims, known for their radicalism. Takfir wa al-Hijra and Ahl al-Sunnah wa al-Tamaat, allegedly operating in Crimea as well, are also marginal fundamentalist groups supporting and spreading Salafist ideology and advocating for “pure Islam”. Both of these groups are closed and their goals are poorly known, but they are among the more radical powers ready for violent actions. Members of Takfir wa al-Hijra were accused of an assassination attempt of Mustafa Djemilev, former head of Crimean Tatars’ Mejlis. Islamist movements in Crimea represents in the majority of cases traditional fundamentalist and Wahhabist views and advocate for preserving of religion and faith, returning to the “pure Islam”, creation of an Islamic State and imposing Sharia Law and spread of Islam all over the world. But it’s very important to mention also that most of the Crimean Islamist groups and movements remain faithful to the Crimean Tatars’ national idea and issue of national and cultural identity, thus, they can represent a mix of fundamentalist Islamist ideology with nationalism. Spread of the radical and extremist Islamists ideas and increasing support of them is a result of a long time policy of ignorance to the problems of Crimean Tatars and hostility of the local pro-Russian authorities and activists as well. Radical groups are popular among the young people, as they give then an answer on their questions and a direction to move in order to resolve these problems. Unlike moderate and official Islamist institutions, radical groups offer active and decisive steps, that are why they attract many youth. Actually, the reasons of spread and increasing of popularity of radical and political Islamist in the region are similar to the ones in Caucasus, with an exception of absence of military conflicts in Crimea and relatively peaceful background. Many experts and journalists compare Crimea to Chechnya and Northern Caucasus, claiming that this region could be a potential military zone and center of terrorist and jihadist activities, but it sounds unfair and exaggerated. Of course, Crimean Islamists are a part of the global Islamist movements and have ties with them, but the situation in the region still remains calmer, than it was in Caucasus, that’s why such a comparison is incorrect. But we shouldn’t also underestimate the raise of popularity of the radical Islamists in the region, especially due to the recent events. Thus, Mustafa Djemilev has warned about the possibility of the dangerous consequences of the Russian military invasion and annexation of Crimea, as it activated Crimean jihadists who fought in Syria and are ready to defend Crimea as well. Mr. Djemilev stated in his recent interview that he personally receives many messages from radical Islamists, Wahhanis and Salafis who state that “an enemy entered our land and we are ready to defend it”. Mr. Djemilev personally is against an idea of a militant jihad, as he is committed to the principles of non-violence, but he cannot prevent such a scenario. Charles Lister, a visiting fellow at the Brookings Doha Center and an expert of jihadist movements in Syria, also stated that Russian invasion is being already actively discussed on social media and internet forums frequented by Islamist and jihadist militants regarding the possibility of “legitimacy of opening a new front of jihad in Crimea”. Thus, the current situation, anxiety of local Crimean Tatars and continuous policies of oppression and trying to delegitimize representative bodies of Crimean Tatars could threat further radicalization and expansion of the foreign fundamentalist ideas and fighters, and the danger of a violent scenario increases.